… whether or not you understand that reason. We hear this expression over and over again in times of need. Although it is of little consolation to hear that the pain you may be experiencing is happening purposely. Why would this be happening to me, we ask? What did I do to deserve this? What reason could there possibly be for this to be happening? Our human mind is somewhat limited in our ability to process an understanding of why things may work out in a way in which we do not accept/do not prefer, etc… This tends to complicate our experience. If you could remember that your life exists in a state of divine perfection (whether that makes sense to you or not sometimes), then you would recognize that you are exactly where you are supposed to be. We always think we know exactly what we need at any given time and when life does not unfold as such, we get upset, discouraged and angered. We feel victimized and we fall prey to negative thought patterns which only succeed in drawing exactly those fears to us as our next experience. It is a vicious cycle and one which is extremely and de-constructively painful. The wise amongst us know that we may not always get exactly what we want at any given time, but we always get what we need, whether or not we know we need it at the time. That is the way of the universe. It can be no other way. You are not being punished for anything, you are not being tortured. If you are not getting something/someone that you are looking for, trust that for the moment, it is being withheld from you because it is not quite at the vibration you require to have a harmonious connection with it. You see, everything is energy and energy vibrates in frequency. When it is time for you to meet a particular person, situation or experience, your vibration will attract that particular energy’s vibration and it will be drawn to you. If is not being drawn to you, it is not of your “caliber” right now. It is not at your level. Therefore you will not attract it. Now painful situations are also magnetically attracted to you – but again, not to punish you, but to offer learning and healing. Look at your life in a bigger way. Look back and remember that those negative experiences you have had are actually those that have brought you to a better place. It may be hard to see it while you are going through it, but it doesn’t make it any less true for you. It is the way of the universe. Trust that you will be given exactly what you need at any given moment. The more you are able to open up and accept the way things are, the easier time you will have with life’s many transitions. 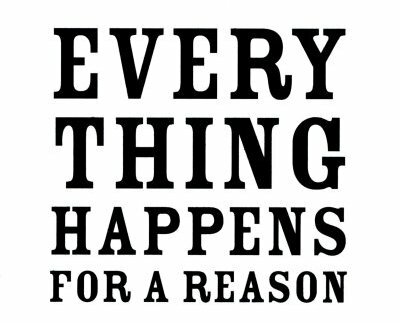 Things happen for a reason. Trust that and let what needs to be, BE.